It’s been coming for a while, but the Australian Prime Minister Tony Abbott has finally won the political backing to repeal the much discussed carbon tax which has become the cornerstone of Australian politics. When Abbott took office in October last year he pledged that a repeal of the carbon tax would be his number one political priority, but it took him nearly a year to repeal a tax that has divided Australians. Australia also becomes the very first country to undo climate policies and the first country to repeal a carbon tax. The 17th of July, the Australian Senate voted in favour of scrapping the tax by 39-32. Until now Abbott has failed to achieve a majority backing to repeal the tax as his party does not control the Senate. Mining billionaire, Clive Palmer was seen to be the swing factor in deciding the outcome of the repeal as his party, Palmer United Party (PUP), holds the balance of power in the chamber. 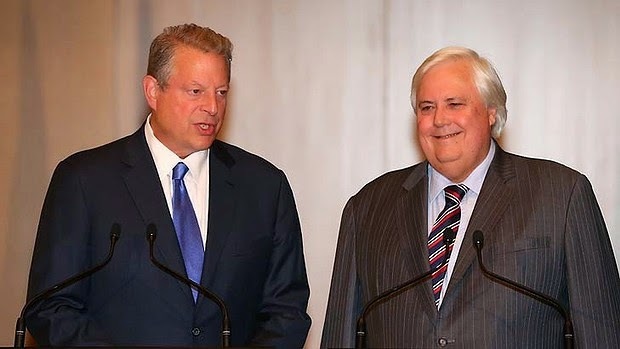 Only a few weeks ago former US Vice President Al Gore held a joint press conference with Palmer. Palmer said that he would not vote for a repeal of the carbon tax, but last Thursday he nevertheless voted for it. It seems negotiation talks with Abbott had sweetened him. In that deal which could be seen as a minor victory for the greens, Abbott agreed to keep Australia’s Renewable Energy Target scheme which is set up to ensure that Australia gets 20% of its electricity from Renewables by 2020 and the A$10 billion Clean Energy Finance Corporation, which Palmer also demanded. Despite this, the Greens and Labor strongly opposed the move, with the leader of the Greens, Senator Christine Milner stating: “This is an appalling day for Australia when a government, rather than lead in the face of what the world is facing up to … is determined to stick with the past”. Australia has one of the highest emissions per capita in the world due to its heavy reliance on coal. Abbott and his allies consisting of heavy industries and the Murdoch media family claimed that the carbon tax was damaging the economy. But the two years the tax has been in place, the country’s renewable energy industry has grown from strength to strength, which has paid off with Australian green jobs and in some states electricity from renewables have been cheaper than that of coal. There is now widespread worry in Australia’s clean energy industry that this could hamper investor confidence and future growth in the sector.